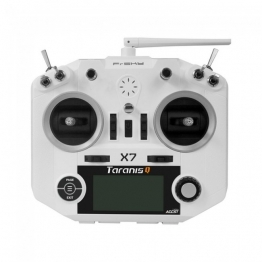 The Frsky Taranis Q X7 Transmitter, Available in Black or White. 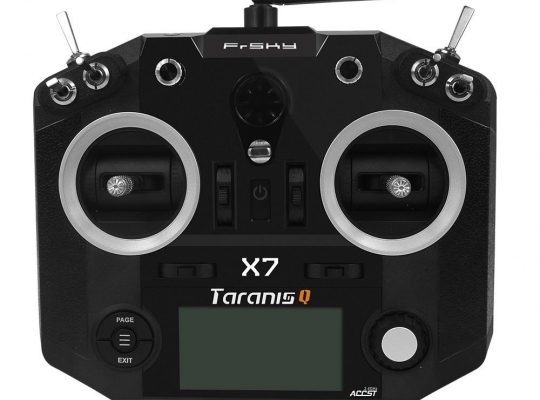 X7 has nearly all of the same features as the Taranis Plus, because it also runs OpenTX. FrSky has focused on reducing the price, while also making some improvements. The only differences are that the X7 has a smaller LCD display, only 6 switches instead of 8, and no side sliders. It has a more modern case design with excellent ergonomics, having large rubber grips on the back and gentle angles on the front. Navigation of the radio is greatly improved with a rotary encoder on the right of the display, and 3 buttons on the left. It also comes with no battery, and no battery charger. The X7 can take six normal AA cells pack, or a 2S Lipo. The X7 uses a battery connector that will mate with those used on 2S Lipo balancing plugs and now has an internal charging curcuit, so no need to remove batteries for charging. The power switch is a flush membrane switch, and must be held down for four seconds to turn off, avoiding turning it off accidentally. The X7 will work with all FrSky receivers and sensors, giving you one of the largest reasonably priced selections to choose from, with FrSky's rock solid RF system which has an excellent reputation. The Taranis X7 can be programmed to give you voice alerts on speaker or through the headphone jack. Count down timers, telemetry value warnings such as low voltage, change of flight mode, landing gear down, etc. can all be set up with a human recorded voice of your creation, or using sound packs available online. The operating system for the Taranis X7 is open-source firmware that has been developed by hobbyists in the R/C community. The programmers of the transmitter’s firmware and the OpenTX Companion software (which runs on Linux, Windows, and Mac) are very receptive to feedback and requests from users. If you can think of a feature or function, chances are the Taranis is capable of doing it. With 60 model memories, 32 mixers, 9 flight modes, sequencing, programmable delays and servo speed, all kinds of logical and hardware triggers, and the ability to assign any channel to anything, it is difficult to come up with something this radio cannot do. Programming can be either done on the radio (great for field changes), or we can set up and test our programs on our favourite computer via the free OpenTX Companion. It even features a handy set up wizard that will perform the basic setup to get you started! It is easy to share programs via the USB port using OpenTX Companion, or via the (optional) micro SD card. 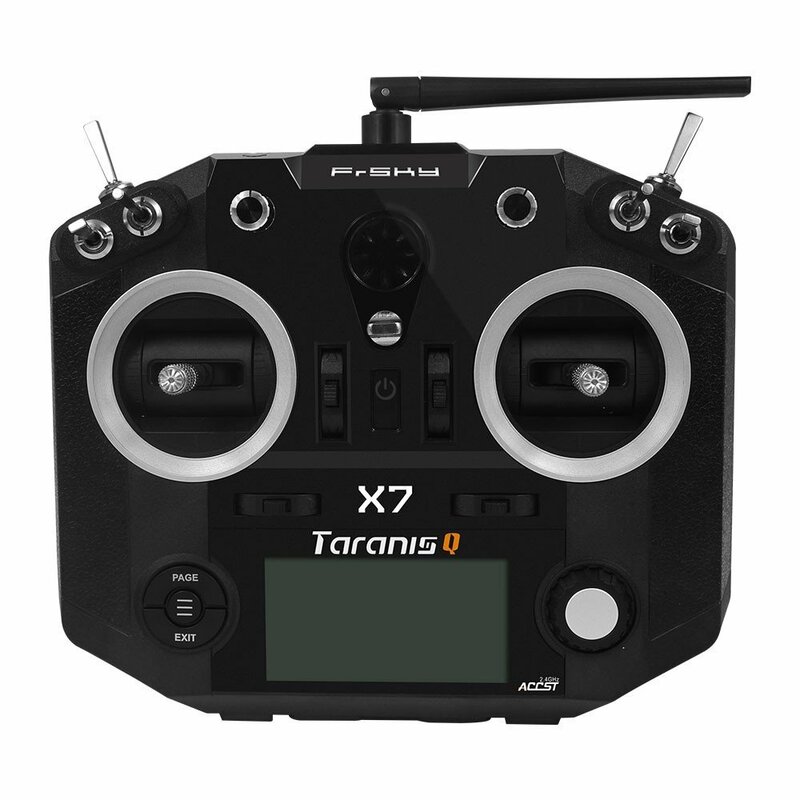 The Taranis X7 has a normal JR style external module port on the back that will accept transmitter modules for other protocols. In the model setup you simply tell the system if you are using the external module, and shut down the internal FrSky module. Now you can use your Futaba, Spektrum or JR receivers if you have a transmitter module that fits in a JR style module bay. The new Banggood Multiprotocol module supports Custom, FlySky, Hubsan, FrSky, HiSky, V2x2, DSM, Devo, YD717, KN, SymaX, SLT, CX10, CG023, Bayang, Esky, MT99XX, MJXQ, Shenqi, FY326, SFHSS, J6 PRO, FQ777, Assan, Hontai, OLRS, FS 2A, Q2x2, Walkera, Q303, and GW008 protocols. FrSky and OpenTX have taken the hobby to a whole new level as they have evolved the transmitter and its firmware to be truly versatile and powerful. No more frustration due to inflexible radios limited by what the supplier thinks you should be able to do. With OpenTX you can even be part of its future development, because it is being done by hobbyists for hobbyists! The TARANIS Q X7 transmitter makes use of FrSky's bidirectional "ACCST" (Advanced Continuous Channel Shifting Technology) communication system. This frequency hopping technology takes advantage of the entire 2.4GHz band resulting in excellent range and reliability. The most important aspect for any transmitter is maintaining a rock solid connection with the receiver. ACCST is perhaps the most reliable protocol on the market today. Being bidirectional means that as well as the transmitter controlling the receiver, data from the receiver can be sent to your transmitter. FrSky knows many things can affect the connection between Transmitter and receiver so RSSI (receiver signal strength indication) is incorporated into all telemetry receivers. The Taranis transmitter is continually monitoring the reception quality at the aircraft. Taranis will alert the pilot before signal quality becomes critical. This saves planes and makes the hobby much safer! A protocol called PXX is used to produce super low latency between the transmitter and RF module. The TARANIS Q X7 has a 128 x 64 LCD outdoor readable screen. The Q X7 has inbuilt telemetry display capability, so you don’t need additional add-ons or 3rd party devices to display telemetry information. Model data, music files, voice files and picture files can be stored on the SD card. The SD card can also be used when updating the software/features of the TARANIS Q X7. The Q X7 can play back WAV (Waveform Audio Format) files stored on its SD-Card. You can easily add custom sound files of your own. The Q X7 also offers vibration as an additional pilot feedback for alarms, etc. You can replace any of the 6 toggle switches with alternative switches (two position, three position, and momentary etc.) and then reprogram the radio for those switches. Taranis has three different types of Failsafe, to help you recover your airplane should you experience a loss of control signal to the receiver: simply holding the last received positions, turning off pulses (for use with flight controllers having returntohome GPS on loss of signal), or moving the servos to custom predefined positions. The open-source software for the Taranis has been developed by hobbyists for hobbyists in the R/C community. The programmers of the transmitter firmware and companion PC software which runs on Linux, Windows, and Macintosh are very receptive to input and requests from users. There are no limitations based on marketing decisions. If you can think of it, chances are the Taranis is capable of doing it. With 60 model memories, tons of mixes, 9 flight modes, sequencing, servo speed, programmed delays, all kinds of triggers, and the ability to assign any channel to anything, it is hard to come up with something this radio can't do. The Taranis has a normal JR style module bay on the back that will accept modules for other transmitting protocols, including Futaba, Spektrum, and JR. The external bay also allows you to add another FrSky module to your radio, giving you a total of 32 channels if you use the eight discrete channels and eight serial SBUS channels available on each module. SBUS is a type of serial communication protocol that allows you to utilize servos specifically designed for SBUS operation and supports multiple channels using only one daisy-chained signal cable. • W:200mm, H:170mm, D:50mm. Weight: 625g.